Although establishing your online business is an amazing opportunity to grow your business in the digital world, there are some issues you have to be aware before you even set up an online store. The legal aspect of running an e-commerce website helps you define your business and your relationship with the customers. The goal is to enable seamless cooperation and provide documents that regulate any issues that might occur along the way. This makes doing business much easier for you, but it also helps your customers to feel safe and confident about your business. In the first place, you should have in mind that the laws differ from country to country. To run a successful business online, it is recommended that you explore the laws that are valid in your country and how each of the following issues is resolved based on the applicable laws. It is also helpful to have some parts of regulations available as documents for your customers. Not only do these help protect you and your business, but they will also contribute to establishing a better relationship with the customers. Your company will instantly appear more legitimate and professional, enabling customers to feel secure when buying from you. Most of the documentation here follows a certain standardized form, which has to state obligations and rights of both parties involved, your business on one side and a customer on the other. A trademark is an important part of owning a business because it protects the brand names and logos. It helps you promote your brand and establish a recognizable name on the market. Customers can identify a certain trademark with a certain brand, gaining you credibility and reputation. Conduct a trademark search – This way you check if anyone is using the same name (regardless if they have registered the name or not). If the name you are planning to use is already a registered trademark, you should avoid possible trademark infringements. Determine the name confusion – You should evaluate the likelihood of the name becoming recognizable and distinguished on the market. Analyze the industry and competitors to make this decision. Decide to register a trademark – If you want to protect your business and your brand, registering a trademark is a recommended option. Your goal is to make this name recognizable and trustworthy among customers, so you do not want to risk anyone taking the name to enjoy the benefits or possibly damage your reputation. ™ – “TM” in superscript symbolizes an unregistered trademark, a mark used to promote or brand goods. ℠ – The letters “SM” in superscript stand for an unregistered service mark, a mark used to promote or brand services. ® – The letter “R” surrounded by a circle is used for a registered trademark. Countries offer formal trademark registration, which is used to protect the brand and the name associated with the brand. You should explore the regulations and the conditions for trademark registration, or you should hire legal help from someone who specializes in the legislation for the country where you do business. The first part of the document should provide the information about your company, as the purpose of the document is to regulate the relationship between your company and the online user. Sometimes, it might be helpful or necessary to give more information about providing the service, as well as possibilities that could lead to modifying or terminating the services due to a certain reason. During an e-commerce transaction, the money is paid upfront, and in return, the product is sent and delivered within the specified timeframe. In this process, it is crucial to realize that refunds are sometimes required. It is a part of doing business online, and having a clear refunds policy on your website allows you to provide a bit of guarantee for the customers. When you define the refunds policy, you determine the conditions under which the product can be returned. In the case of providing a service, it is also possible to issue a refund, but most service providers actually enable trial period instead. The period of 7 to 30 days is commonly used as a test period, during which the customer has the right to change his or her mind. If the customers are eligible, they have the right to return the product and receive a full or partial refund. When you provide refunds policy on your website and asking to accept those terms before initiating the transaction, you get customers to read and accept these terms. This way, they are familiar with the conditions that apply when a customer wants to claim a refund, regardless if that claim is due to the product damage, failing to fulfill the expectations, etc. Handling refunds requests promptly is a way to establish a good relationship with the customers and to gain a good reputation. Take every refund request with seriousness and treat customers fairly. If they are eligible for a refund based on the conditions of the refunds policy, you are then obliged to issue a refund. Sometimes a customer might ask for a refund even though conditions are not fulfilled for that refund to be issued. For instance, a customer might want to return the product after three months when the refunds policy states that the product may be returned within 14 weeks. In these situations, you could always refer the customer to the refunds policy document. Personal information can be anything that defines a user, such as a name, address, the date of birth, contact information and even credit card information. These data are often provided by the users themselves when they fill in a form, but they can also be gathered through the use of third-party integrations, such as the usage of the cookies. Besides the data protection, where you agree not to disclose personal information about the users who give you the right to use the data for your own business, there is another segment related to privacy, and that is anti-spam. Since email marketing is a very powerful method for reaching the customers and promoting your business, it is essential that you follow anti-spam regulations and be extra careful when using the user information to contact the customers. This information is required by the customer, and it is usually the name, the email address, etc. You should inform the customers how you collect and store the data. You could also mention the usage of cookies, in which case some data may be left on the user’s computer to track the habits and personalize the online experience. The customers have the right to know in what kind of purposes will the data be used, for example, for contacting the customers in the future, sending promotional announcements, etc. This section should also state whether you plan on sharing or even selling the information about the customers. The customers should have insights into the information collected about them, as well as the instructions on how to change or delete them. The customer can send a request for his or her data to be removed from your database in which case you have to act upon this request. Information is often stored much later after the transaction is over. This is something you should inform the customers about. When you are selling online, it is essential to be aware of all the regulations and laws that are applicable in the country where you do business. Not only is it going to be helpful in the long run and assist with successfully running a business, but being familiar with the valid regulations will also spare you any issues and disputes that might occur with customers. The documents that regulate the usage of your e-commerce website should be accurate, current, valid and concise. The customers should find them easily on your website and review them before deciding to do business with you. These documents keep your business credible in the mind of the customers while building trust in your brand. Due to the legal character of these documents, it is recommended that you seek legal advice on the matter in the particular country. 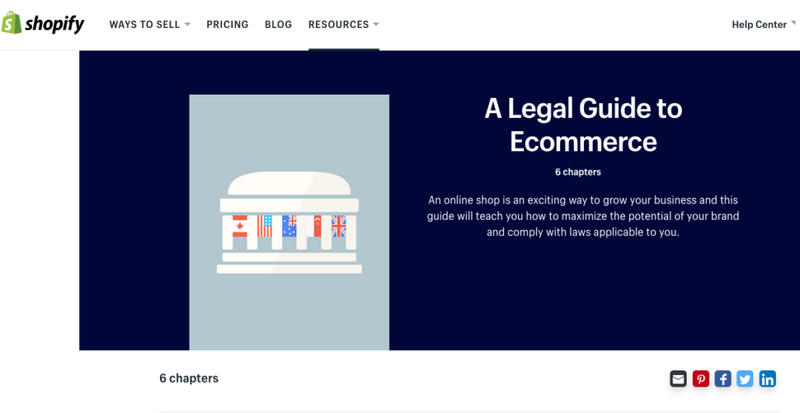 To help you with some general guidelines typical for some countries, you could refer to this online resource: A Legal Guide to Ecommerce. You will find general laws and regulations valid in Australia, Canada, Singapore, United States of America, United Kingdom and New Zealand.